This weekend I cleaned and organized my pantry. When we moved I just sort of shoved everything into it and with d-day approaching figured it was now or never. In the pantry is a giant size box of Rice Kripies that doesn't fit on any of the shelves. I was very tempted just to bust it open and make some rice krispie treats, but refrained because I would probably have eaten them all. It is a really good thing that I hadn't seen these s'more rice krispie treats before I made that decision, because I may not have been able to resist. Who can resist rice krispie treats AND s'mores! I am starting to think Naomi is one part genius and one part evil. I guess that makes her an evil genius! 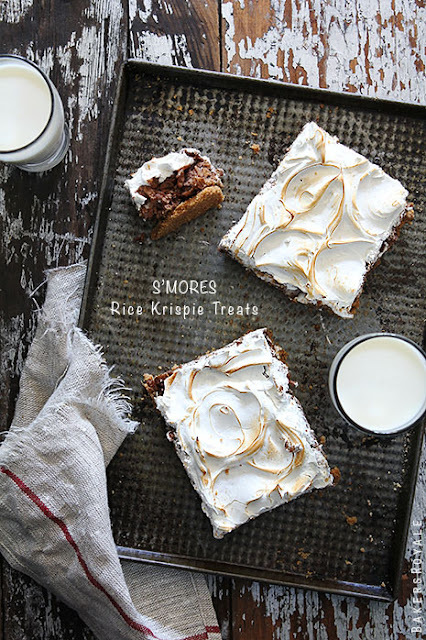 You can get the recipe for these s'more rice krispie treats over at Bakers Royale.